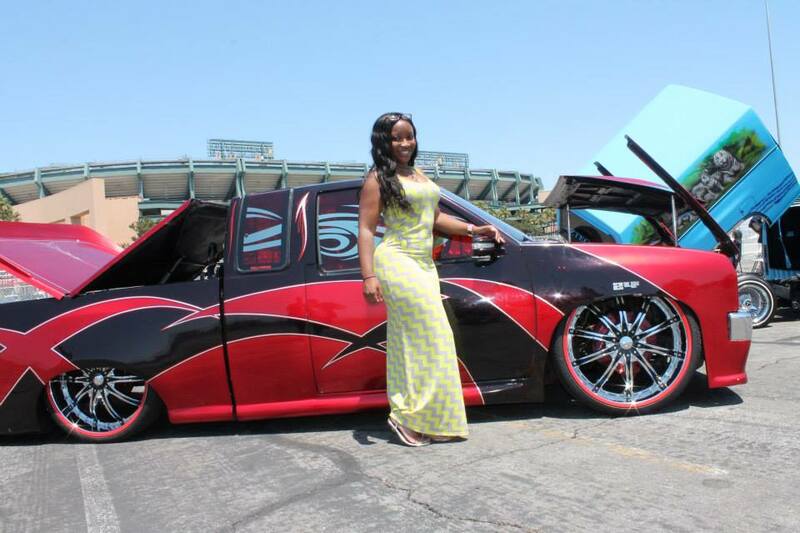 Sunday August 11, 2013 was the day where Dub Magazine brought their car show tour to one of their biggest tour stops, Anaheim, California. And guess who was there to take it all in? After seeing the coverage from last year, I said "I have to go", and I was extremely happy I did. The Anaheim stop of the car show tour is always held at the Angels Stadium of Anaheim, which is a big area to hold a show. With this tour stop, there was great entertainment with Problem (I had no idea who he was until I landed in LA), Juicy J, Tyga, and everyone's favorite New York rapper, French Montana. Combine that with a great crowd, great food, great weather, great models, and most importantly great cars, I got my money's worth traveling from Atlanta to Los Angeles. greet me as I walked in, I knew I had my work cut out for me. You know this is a Nissan Maxima. At this point, I decided to walk around a bit, and guess what I ran into? Ghost Motorsports brought a black Rolls Royce Phantom. Aztec Image Car Club brought some very customized vehicles. One of them, is a red lowrider truck, the other is a van. This same car club found me at the other side of the show and asked me to take pictures by their vehicles. I did post by the vehicles, even though I am a shy person. Then I made it to the Nokturnal area. The first vehicle I came across was a Range Rover. What stood out to me was the interior. Ever see a Range customized like this? And that's just a piece of the interior. And yes, even the Nokturnal kids have to turn heads when they drive. Yes, this is a Jeep. I call these lazy seats since the seats turn for you to get in and out easier. The Bentlex. Continental in the front, GS in the back. One of two Nissan Murrano I'm showing off. This show also had a special tribute to photography great, Jae Bueno. On this day, his widow, Stephanie, decided to unveil Jae's project he was working on until his death. From then on, Stephanie is continuing with her photography and she finished his project... and also brought his camera that he used to create the work he was famous for.